Hinges and hasps must be attached to storage doors by bolting, riveting, or welding so that the door bolts cannot be removed from the outside. Having the appropriate locks will help hinder robberies and break-ins. 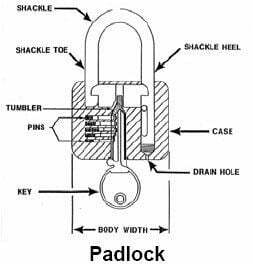 The ATF recommends that any padlock securing an explosives magazine have an ASTM (American Society of Testing Materials) rating of at least 5. More information can be found in ASTM’s F883-97 “Standard Performance Specifications for Padlocks”. The locking requirements for indoor magazines are similar to outdoor magazines requirements with a few exceptions. An indoor magazine located in a locked secured room with door hinges and lock hasp securely fastened to the magazine (noted in 27 CFR 555.208(b), 555.210(b) and 555.211(b)), may have each door locked with one steel padlock that meets the stated requirements above. “Hockey puck” locks have no visible shackle. The locking bolt and staple are completely covered and protected by the lock body. 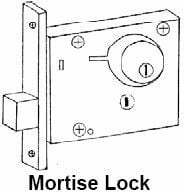 For the locks to be approved for use, the lock must have a casehardened shackle and a close-fitting shroud to prevent sawing or prying of the lock. Prior to installation, the licensee/permittee must submit a request for a variance. Flush mounted locks (aka “flush-mount lever locks”) do not provide sufficient protection against pulling or prying the lid off the magazine. A flush mounted lock fails to provide an acceptable level of theft-resistance for indoor storage of low explosive materials and may not be used to secure Type-4 indoor magazines. Additional information can be found at ATF Ruling 2004-3. Licensee and/or permittee who desires to use this type of lock in a secured room that is locked as noted in subparagraph (b) of 27 CFR 555.210 may submit a request for a variance. Type-2, -4, and -5 unattended vehicular magazines must have the wheels removed or otherwise immobilized by kingpin locking devices. Other methods must be approved by the Director. Federal regulations require that Type-1 and Type-2 explosive magazines be bullet-resistant. “Bullet-resistant” means resistant to penetration by a bullet of 150 grain M2 ball ammunition (nominal muzzle velocity of 2,700 feet per second). Construction requirements for Type-2 outdoor magazines (i.e. exterior and doors constructed of not less than ¼-inch thick steel and lines with at least 2 inches of hardwood) are fixed to guarantee bullet-resistance. ATF Ruling 76-18 details alternate construction standards for explosive magazines. Type-2 indoor magazines do not need to be bullet-resistant if the buildings in which they’re stored in provide protection from bullet penetration. Type-2 indoor magazines have less strict construction regulations due to the additional protection afforded by the associated building (see Part 555.208(b)). Please note that if the magazine, nor the building in which it is located, is bullet resistant, then the magazine and building must meet bullet-resistance requirements. If there’s a concern that the combined construction doesn’t meet listed requirements and ATF Ruling 76-18 doesn’t address the situation, a licensee or permittee may submit a request for a variance to the requirements contained in 27 CFR 555.208. Variance requestions should be submitted to the Explosives Industry Programs Branch via your local ATF office. When submitting your request for a variance, please include specific construction information for both the magazine and building in which it is located.